West Ealing Neighbours, with the support of Ealing Council, is launching its new monthly craft market in St James Avenue on Saturday 7th April. The market will open from 10am-3pm and its 16 stalls will feature a regularly changing selection of handmade goods from local craftspeople. There will also be free teas and coffees provided by St James Church. WEN has been working with the Council on plans for this market for well over a year. 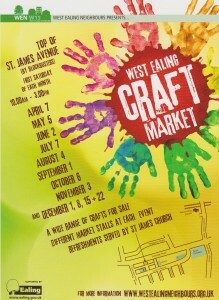 We want to build on the success of the annual Arts and Crafts Fair in St James Church and the two West Ealing Family Days to pilot a regular craft market offering quality, locally made goods. If we are successful, we hope to increase the frequency of the market. A very welcome addition to West Ealing, many thanks to all who made West Ealing Craft Market possible. Previous PostPrevious Fancy joining a community choir in West Ealing?